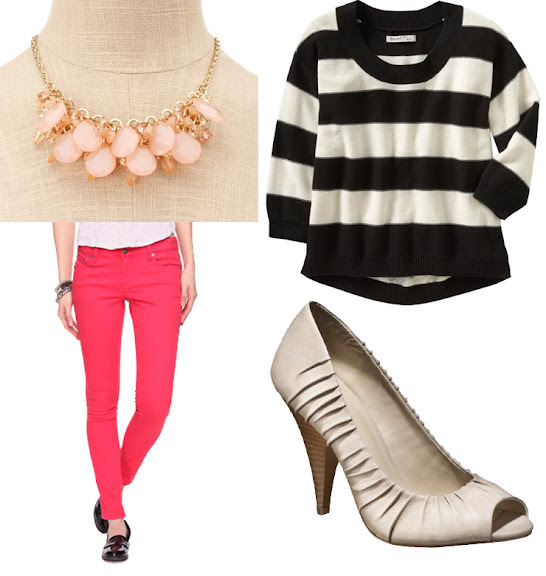 I am slightly obsessed with this striped sweater I posted about a few weeks ago. So, I thought I would create a look around a similar sweater. I am clearly loving the bold pants trend going on right now and seriously want to get my hands on a hot pink pair. I really need a pair of bright pants too. And bold stripes are another thing I'm loving right now. So, all around this is a PERFECT outfit for me. Nice job! these selections are pretty awesome...thanks for sharing! BEAUTIFUL! I adore this outfit! We are Moving to Corpus Christi!